La Syrie Sainte. Ou la mission de Jesus et des peres de la compagnie de Jesus en Syrie. Paris, Jean Henault, 1660. 2 parts in 1 volume. 8vo. 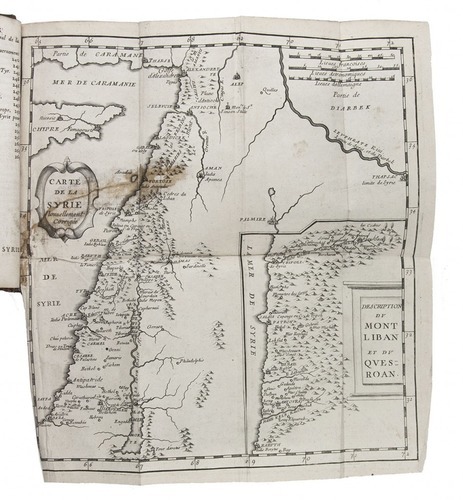 With a folding engraved map of Syria (including Lebanon, eastern Cyprus, and Palestine as far south as Gaza and the Dead Sea), with an inset map of the Lebanese coast from Beirut to Lebanese Tripo. Contemporary mottled tanned sheepskin, with gold-tooled fillets on the spine and boards. 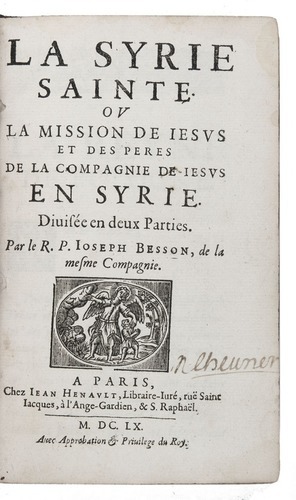 First (and only early French) edition of an account of the Jesuit mission in Syria, along with a description of Syria in general, by the French Jesuit Joseph Besson (1610-1691). He covers much more territory than the modern "Syria", including the whole of Lebanon and much of Palestine, so that there is, for example, a chapter on the churches of Jerusalem. The second part also includes travels in other parts of the Middle East. Before Bresson travelled through Syria, Persia and Arabia, he was rector at Nimes and taught rhetoric and philosophy. The first part specifically recounts the establishment, development and progress of the Jesuit mission in Syria. The second part (with a drop-title and its own pagination) describes the holy and sacred sites Bresson visited. It gives a very detailed and interesting description of Syria and of the various customs and habits of the Druse, Maronite, Armenian (Catholic and Apostolic), Turkish, Jewish and other people there. With the author's five-page dedicatory letter to Queen of Poland (Maria Ludwika), whose husband King Jan Casimir II had joined the Jesuit order in 1641. 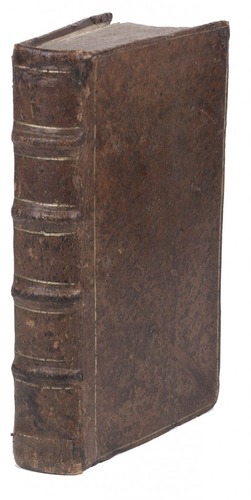 The binding has been restored at the head and foot of the spine, but appears to retain the original headbands. The mottling has caused some surface damage, but the binding remains structurally sound. 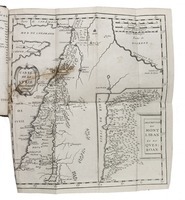 With a water stain on lower outside corner in the second half, not reaching the text, and a stain along a repaired tear in the map, but still a good copy. De Backer & Sommervogel 1412; Chadenat 756.